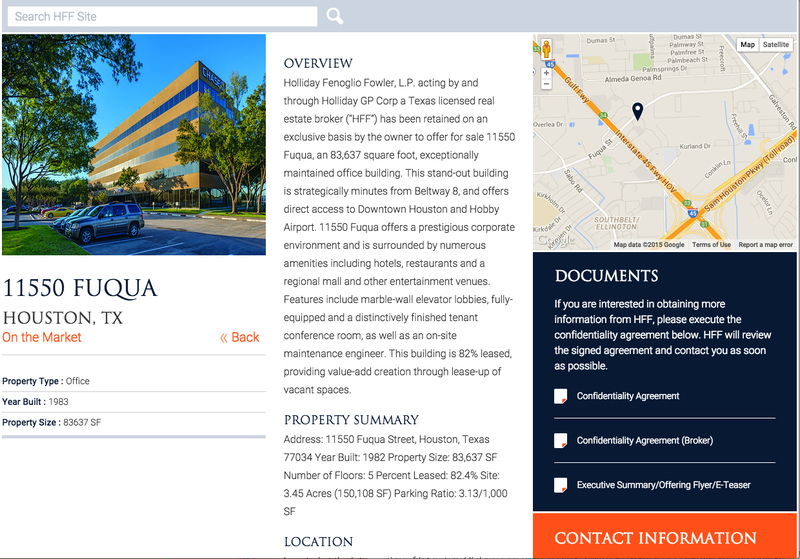 HexaGroup recently launched the redesigned website for HFF (Holliday Fenoglio Fowler, L.P.), one of the largest and most successful commercial real estate intermediaries in the United States. On a mission to strengthen the company's online presence, HexaGroup and HFF worked together to create a website that was truly reflective of the caliber of HFF brand and would better serve its audience in the commercial real estate industry. HexaGroup worked with HFF’s Marketing and IT teams to modernize the way HFF’s commercial real estate capital markets services are presented online. 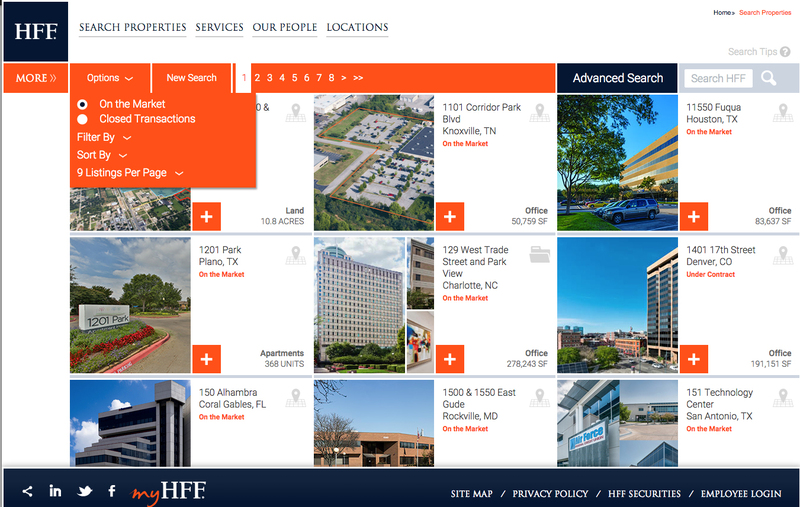 Designed to cater to the information needs of owners and investors of commercial properties, the new hfflp.com provides a more user-friendly experience with intuitive navigation and interactive resources. HexaGroup conducted a thorough market analysis to determine the needs of web users in HFF's target markets, before developing the site architecture and SEO strategy. The site was built around responsive web design methodology, which allows it to adapt to all device types and screen resolutions. Some of the website’s other design features include new and updated graphics, a large-scale photo slider to highlight site sections, and social media integration. HexaGroup worked with HFF’s IT and Business System teams to fully integrate the new site with the company’s ERP system, CapTrack. The tight integration between HexaGroup’s proprietary CMS system and CapTrack allows for real-time display and management of all aspects of key HFF business elements and also facilitates the management of all inbound inquiries. Myra Moren, managing director of Marketing for HFF said that the redesigned website was built to be efficient and user friendly and will provide owners and investors with the most up-to-date information on our properties and services to ensure the best commercial real estate transaction experience. The new hfflp.com provides owners and investors with the most up-to-date information on properties and services. Users can now search properties by transaction service or property type, as well as service type, property size, location, and name. Detailed information about each listing is now available online, including images, contact information, and PDFs of related documents, such as executive summaries and confidentiality agreements. In addition, the implementation of Google Maps allows users to view the exact location of each property. HFF (Holliday Fenoglio Fowler, L.P.) and HFFS (HFF Securities L.P.) are owned by HFF, Inc. (NYSE: HF). HFF operates out of 23 offices nationwide and is a leading provider of commercial real estate and capital markets services to the U.S. commercial real estate industry. HFF together with its affiliate HFFS offer clients a fully integrated national capital markets platform including debt placement, investment sales, equity placement, advisory services, loan sales and commercial loan servicing. For more information please visit www.hfflp.com or follow HFF on Twitter @HFF.